Scientists have found remarkable evidence that indicates the universe should not exist at all, a bizarre discovery indeed. 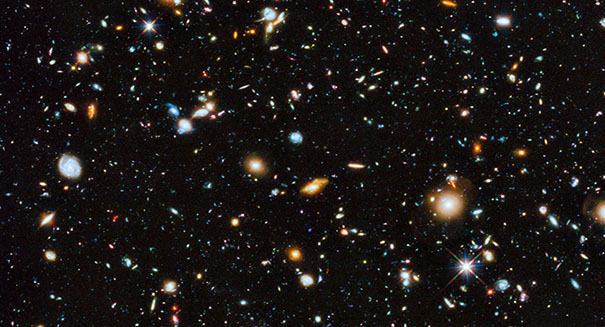 As we reported recently, a team of scientists have just discovered that our universe should not exist at all, a puzzling finding considering the fact that we undoubtedly do exist. And it is the details behind this finding that are so incredibly fascinating, and cause us to ask a lot of questions about the nature of reality itself. The latest development centers on 65 pounds of germanium, a rare isotope, which was placed a mile underground in an abandoned mine in South Dakota and cooled to extremely low temperatures. The Majorana Demonstrator, as it is called, could be the key in helping us crack the code of why we exist at all, and whether we can really say the Standard Model of physics is correct. Basically, the confusion is this: the Standard Model suggests that all matter in the universe has an equal amount of antimatter. But we have totally failed to detect antimatter. Scientists have zeroed in on neutrinos as a possible way to find out more. Neutrinos are created by the decay of an atom, which leaves behind an electron, proton, and neutrino. Neutrinos are weird because they can pass straight through an entire planet without slowing down, which makes it very hard to study them. Scientists think neutrinos may be their own antimatter particle. If we could provide this to be the case, it would totally change our understanding of physics itself. So why are neutrinos so important to scientists? Despite having virtually no mass whatsoever, they are one of the essential ingredients of the universe. And scientists think understanding them could crack the code to existence itself. The universe is filled withthese massless, chargeless particles that have no energy, and no one figures out why. It is a mystery that strikes at the heart of the very fundamental fabric of our universe.